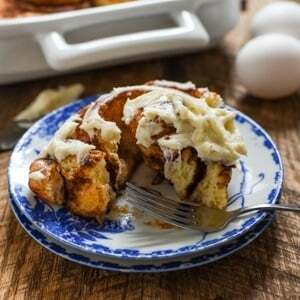 Who knew leftovers could taste this good? 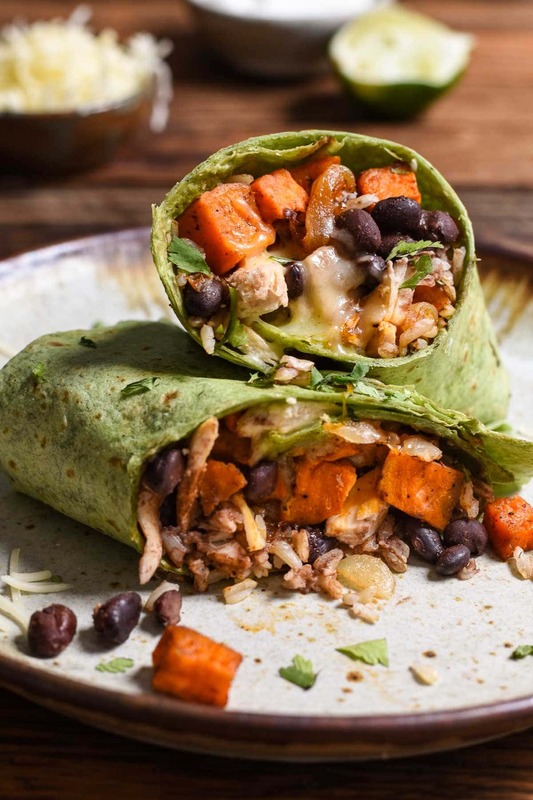 These Sweet Potato Black Bean Burritos loaded with chicken, cheese, and rice, are perfect for using up your leftovers, and they make a great freezer burrito! I’ve also included plenty of other ideas for turning your leftovers into quick and tasty freezer burritos. The other day one of my good friends made my Blueberry Oatmeal Muffins. She has two little ones (one born the exact same day as little P! ), and like the brave and courageous woman she is, she made the muffins while both kiddos were fully awake and zero other adults were around. After accomplishing this admirable feat, she texted me a little suggestion. Perhaps I should include a separate prep time that would let parents know how long the recipe takes if you’re making it while children are clawing at your legs, begging for snacks, and/or coloring on the walls in another room. A “parent’s prep,” if you will. Does the recipe say 15 minutes prep? Go ahead and double it. Have more than one kid? Triple it. I had to chuckle, because it’s so true. That’s just basic parenting math. What used to take minutes now takes a half hour. I want to weep when I think about my pre-kid grocery store runs. If I forgot a carton of sour cream, it was no big deal. I could run to the store and be back in 20 minutes. Now it takes us that long just to get out the door. Toddlers have many wonderful qualities, but efficiency is most certainly not one of them. An easy, time saving meal is worth more to me now than ever, which is why freezer burritos have become a regular part of our line up. Before P was born, I made and froze these Mexican Breakfast Burritos. They were a lifesaver in the first few months when I could barely remember whether I was wearing pants, let alone decide what to eat for lunch. Even though the newborn craziness is long gone, I’ve come to appreciate the ease of pulling a burrito out of the freezer, microwaving it, and having a great meal on the table in minutes. My burritos these days tend to be a little less planned and a little more a conglomeration of whatever leftovers we have in the fridge. 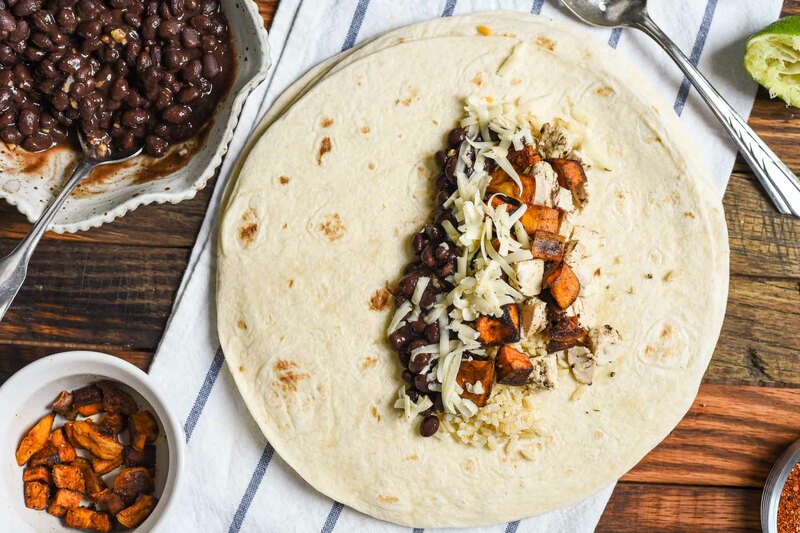 In this post, I’ve included a recipe for my current favorite combination–Sweet Potato Black Bean Burritos–but I also wanted to leave you with plenty of ideas for making the most of whatever leftovers you happen to have on hand. 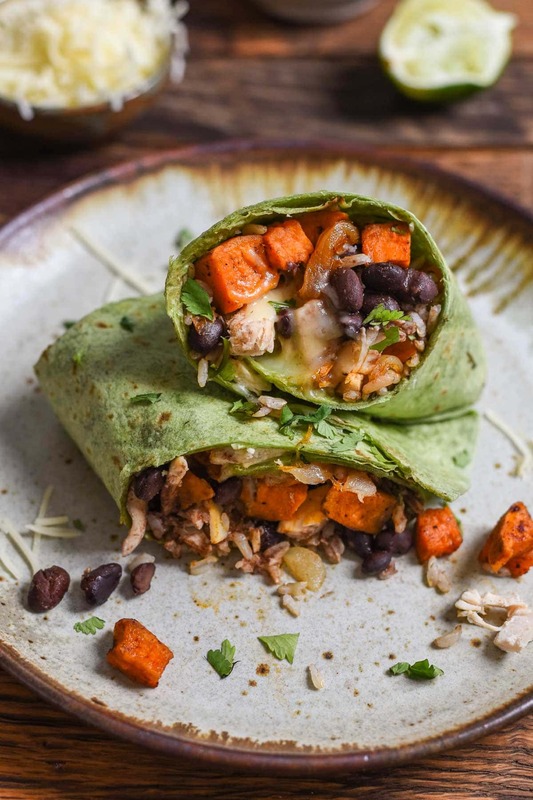 These particular burritos are a combination of rotisserie chicken, cilantro rice, Chipotle Black Beans, Maple Roasted Sweet Potatoes (with a little chili powder and smoked paprika added! ), and a layer of monterey jack cheese that demonstrates my total lack of regard for skinny jeans. The combo is delicious, with great texture, and tons of protein to keep you full all day. At home, I like to serve them with a little salsa and sour cream. At work, my husband adds his desk stash of hot sauce. Pretty much everything in these burrito was made for another meal, then repurposed to stock our freezer with ready-made lunches or dinners. 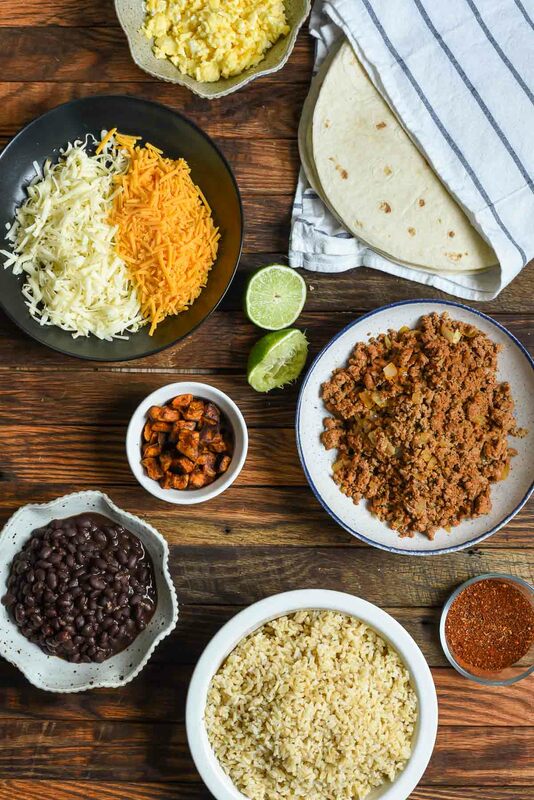 I LOVE when recipes can pull double duty like this, and really, your fridge is a treasure trove of burrito fillings just waiting to be discovered. The picture below was from a burrito making extravaganza I had a few months ago. Cheeeeeeese (duh). Monterey Jack is my favorite, but cheddar, Mexican blend, or pepper jack are all great choices. The possibilities are endless. Use your creativity and your tastebuds to create your own favorite. My biggest tip? Make sure every aspect you’re putting into the burrito is well seasoned and tastes good on its own. Nothing makes for a bland burrito like plain white rice and a can of black beans with no seasonings. Also, save any wet fillings to be used as toppings. Salsa, sour cream, and guacamole are wonderful, but they can all make for a soggy burrito, and nobody likes a soggy burrito. The recipes I’ve included below should be enough to make around 10 burritos. This is enough for us to eat them for dinner one night and for me to stash some away for emergency meals. For folding, layer the ingredients a little right of center of the burrito, fold the bottom up and the top down, then roll from right to left to create a good seal. I like to wrap these in saran wrap then store in a freezer zip lock bag. When you’re ready to eat, simply remove from the package, cover with a damp paper towel, and heat for about a minute, flip, and heat an additional 30-60 seconds. If you have access to a toaster oven AND you don’t have hangry children whining in the background, you can send them through a toasted oven for a few minutes for a golden, crispy crust. Otherwise, grab some sour cream and salsa and dig right in! 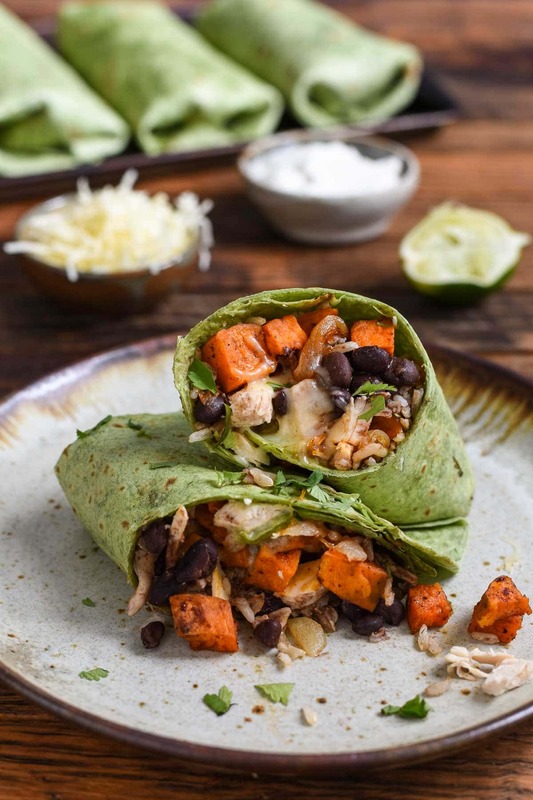 Sweet potatoes, black beans, chicken, cheese, and rice come together to make a protein packed burrito that's perfect for freezing! Combine the rice, water, butter, bay leaf, and salt in in a medium sauce pan. Bring the mixture to a boil, then reduce heat to low, cover, and simmer undisturbed for 18-25 minutes or until liquid is absorbed. Remove to heat and keep the cover on for another 5 minutes. Transfer the rice to a bowl, fluffing with a fork. Stir in the cilantro and season with lime juice, salt and pepper to taste. Preheat the oven to 425 degrees. In a bowl, toss the sweet potatoes and onions with the coconut oil, maple syrup, paprika, and chili powder. Season generously with Kosher salt and a few turns of pepper. Spread onto one or two baking sheets, depending on the size. Roast for 15 minutes and stir. Return to the oven and roast for an additional 10-20 minutes or until sweet potatoes are soft and starting to caramelize around the edges. Combine all the ingredients in a sauce pan over medium heat. Cook until heated through, stirring occasionally. Remove from heat. Spread the burrito shell out. Layer the rice, sweet potatoes, black beans, and chicken a little right of center, leaving an inch on the bottom and the top. Cover with cheese. Fold the bottom part of the shell up and top part down, then roll the burrito from right to left. Repeat with remaining shells and fillings. Wrap in saran wrap then place in a zip lock freezer bag for storage. To reheat, remove from saran wrap, wrap in a damp paper towel, and microwave the burrito for 1 minute. Flip over, and microwave an additional minute, if needed. Place in the toaster oven for a few minutes, if desired. Serve with sour cream, salsa, guacamole, or hot sauce. I’m not usually a big burrito person (I don’t even know why!! 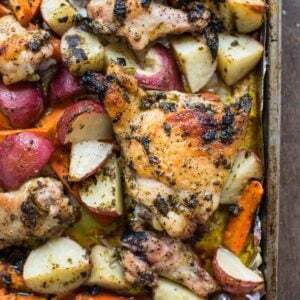 ), but these look seriously awesome and like the perfect dinner!! These look delicious! Just happen to be making the Maple Roasted Sweet Potatoes for our supper tonight. Now I know what I can do if there are any leftovers. I like the rice recipe you have included here. Never thought of adding lime juice to rice but it sounds like a sure fire way to end the blahs of plain rice. Thanks for posting. The lime juice definitely helps brighten it up. I sometimes cook rice in chicken broth to give it a little more oomph too.